Girl's got a new iPod. Finally. 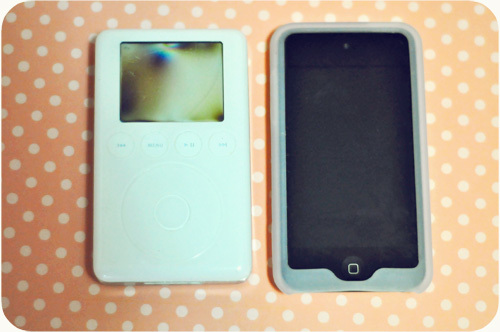 Replacing my iPod from 2003 (on the left) is the iPod Touch 4 8G (on the right). And I know it sounds silly, but I have a total crush on it. Been having way too much fun with Facetime and Words with Friends. I've had it for a week and I am completely smitten with it. I have been loyal to Sprint since 1996, and because there haven't been any announcements for them carrying the iPhone 4 anytime soon, getting this iPod was the next best thing. PS- I am also totally loving Skype, and what I used to take these photos, Jing. Not that I need anymore technology crushes, but what are your favorite apps or gadgets?